Discussion in 'Sword Discussion' started by daizee, Aug 23, 2018. Years ago I was given a relatively hideous sword (european, two-handed?) and dagger combination. Last night I decided it had enough reach for some pruning, even while dull, so I dug it out of deep storage. The handle treatments are horrible, so I pulled them apart on both pieces. While the guard and handle treatments clearly matched, the blades are completely different. The dagger is really badly made, and thoughtfully marked "INDIA" on the tang. It is a crime against craftsmanship. I will destroy this blade and not reassemble it. The world will be a slightly better place. The sword is surprisingly better. Looks to be an appropriate grade of carbon steel, reasonably well executed for a budget piece. remnants of heat-treat scale on the tang under the handle, and it has what I think is the right amount of spring to it. The tang is too short for strength, and becomes a long thin rod with threads on the end. But I'm toying with the idea of raising the tang and re-guarding/hafting it. Before I 1) go to any trouble at all, and 2) do something irreversible, can y'all help identify the manufacturer of this blade? The mark is below. Google image search turns up nothing. Various combinations of "HAB", "sword", "forge" etc. turn up nothing useful. My expectation is that this isn't valuable, but some insight into the manufacturer may give me an idea of the quality of the piece of steel I've got on my hands, and whether my time would be better spent making my own knives instead of on a diversionary side project. 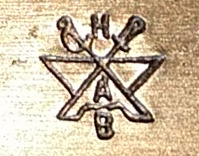 There is H.A.B. classic blades from Pakistan that sells cheap pattern welded blades on ebay. Could they be related? That sounds entirely plausible, though the current marks associated with that name are a buck. Hmm. The tang is too short for strength, and becomes a long thin rod with threads on the end. But I'm toying with the idea of raising the tang and re-guarding/hafting it. You wont hurt a thing. Re-tang that bad boy, you're not destroying anything valuable if that was your worry. It'll never win any awards but if it gets strong and sharp enough for light cutting I'd say it was worth your time and effort. Build it up some, better hilt heavy than blade heavy. I've hung it up over the back burner for the moment while I think about the handle treatment, and the pommel in particular.